Objectives: Approximately 10 to 25 lung transplant procedures are performed annually in Finland, and 1-year survival has been 95% over the last 10 years. Our aim was to find associations between perioperative fluid replacement therapies and postoperative patient outcomes, with special emphasis on the use of colloids and blood products. Materials and Methods: We retrospectively evaluated data from 100 patients who underwent lung trans­plant with cardiopulmonary bypass support in Finland from 2007 to 2013. Outcomes of interest were length of intensive care unit and hospital stays, time in ventilator, use of extracorporeal membrane oxygenation postoperatively, postoperative renal replacement therapy, postoperative graft failure, and 1-year mortality. Results: Of 100 patients, 12 were on extracorporeal membrane oxygenation preoperatively. The 1-year mortality was 5/100 (5%), and the 3-year mortality was 7/100 (7%). Intraoperative fluid balance was positive (4762 ± 3018 mL) but fell significantly postoperatively (below +1000 mL on postoperative day 1). During postoperative days 2 to 7, net fluid balance continued decreasing and stayed negative. Intraoperative use of hydroxyethyl starch and fresh frozen plasma were significantly higher in patients who died during follow-up versus those who survived (P < .05). Intraoperative use of fresh frozen plasma, but not red blood cells or platelets, correlated with graft failure (P = .012). Postoperative use of colloids or blood products did not correlate with mortality or graft failure. Patients who were on extracorporeal membrane oxygenation preoperatively stayed longer on ventilators and had longer intensive care unit and hospital stays (P < .001). Eight patients needed post­operative renal replacement therapy. Conclusions: Intraoperative use of fresh frozen plasma and hydroxyethyl starch is associated with increased mortality and graft failure. Postoperative use of colloids and red blood cells did not correlate with patient outcome. 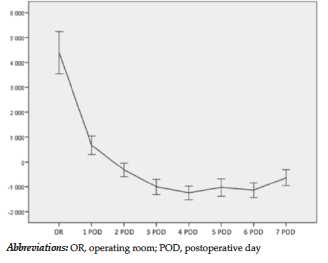 Use of extracorporeal membrane oxygenation preoperatively resulted in prolonged length of hospital stay. Perioperative fluid replacement therapy in this group of patients is challenging. Cardiopulmonary bypass during surgery often leads to fluid overload. In most cases, additional transfusion of blood products is also necessary.1 Fast recovery of the graft is crucial, even though lung function is temporarily impaired due to ischemia-reperfusion injury postoperatively. Our aim was to find associations between peri­operative fluid replacement therapy and post­operative patient outcome and recovery time, with special emphasis on the use of colloids and blood products. Our hypothesis was that crystalloids and small perioperative fluid overload are beneficial after lung transplant. This study is a single center retrospective cohort study that included 100 lung transplant recipients in Finland from January 2007 to January 2013. Patients who received bilateral, unilateral, and retransplant procedures were included. Patients with combined organ transplants were excluded. Preoperative information included body mass index, primary diagnosis leading to transplant, hemoglobin level, creatinine level, glomerular filtration rate (GFR), and use of preoperative ECMO. Intraoperatively, we recorded fluid balance, amount of crystalloids (Ringer and NaCl), colloids (hydroxyethyl starch, gelatin, albumin 4%, and albumin 20%), and blood products (red blood cells, fresh frozen plasma, and platelets) administered, intraoperative diuresis, and lowest intraoperative hemoglobin level. Fluid balance and amount of crystalloids, colloids, and blood products administered, hemoglobin and creatinine concentrations, and urine output were recorded daily for the first postoperative week. Outcomes of interest were 1-year mortality (cause of death), graft failure, length of stay in the intensive care unit and hospital ward, time on ventilator, postoperative fluid balance, need for postoperative renal replacement therapy, GFR 1 year after trans­plant, and use of ECMO postoperatively. The results are presented as means ± standard deviation (when distribution was normal with Kolmogorov-Smirnov test) or medians (25-75 percentiles) when distribution was not normal. The t test or Wilcoxon test was used for paired com­parisons. Kruskal-Wallis test was used for repeated measurements. Bivariate correlation with Spearman coefficient was calculated when appropriate. Statistical analyses were performed with SPSS software (SPSS: An IBM Company, version 19.0, IBM Corporation, Armonk, NY, USA). For all analyses, P < .05 was considered statistically significant. Baseline characteristics for all patients are shown in Table 1; 100 patients were studied. Mean age at transplant was 51 ± 12.8 years. We found that 12 patients were supported with ECMO as a bridge to lung transplant. 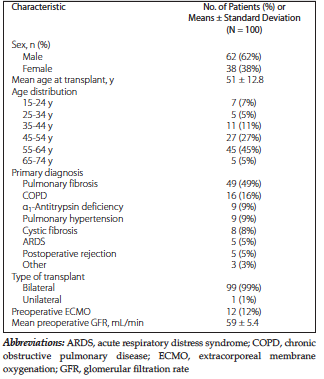 The most common cause for transplant in our center was pulmonary fibrosis (49%), followed by chronic obstructive pulmonary disease (16%) (Table 1). One-year postoperative mortality was 5/100 (5%). Three-year mortality was 7/100 (7%). The median time (25-75 percentiles) on ventilator was 32 hours (20-138 h) after surgery, the median time in intensive care unit was 8 days (5-15 d), and median hospital stay time was 27.5 days (19-43 d). Preoperative mean hemoglobin concentration was 137.8 ± 23.8 g/L. However, 80 patients (80%) required red blood cell transfusions intraoperatively. The rate for fresh frozen plasma transfusions was 59%, and the rate for platelets was 52%. Intraoperative use of hydroxyethyl starch and fresh frozen plasma was significantly higher in patients who did not survive (1500 ± 707 and 2100 ± 707 mL) than in survivors (734 ± 393 and 973 ± 774 mL) (P < .05; Table 2). Intraoperative use of fresh frozen plasma, but not of red blood cells or platelet concentrates, correlated with graft failure (P = .012, with Spearman coefficient of 0.325). The posto­perative use of blood products or colloids (calculated separately and together) did not correlate with mortality or postoperative graft failure (P < .05). Mean fluid balance was positive on the day of surgery (4762 ± 3018 mL) but fell significantly postoperatively, being below +1000 mL on the first postoperative day. At 2 to 7 days after transplant, fluid balance continued decreasing and stayed negative (Figure 1). The median preoperative serum creatinine level was 56.0 μmol/L (64-80 μmol/L), and mean GFR was 89.9 ± 23.6 mL/min. One year after transplant, GFR was 56.1 ± 14.1 mL/min (range 22.9-148.0 mL/min), and only 3 patients (3%) had GFR below 30 mL/min, but 40.4% of patients had GFR above 60 mL/min. Eight patients needed postoperative renal replace­ment therapy, and 1 patient underwent kidney transplant. Patients treated with ECMO preoperatively stayed longer on ventilators, and their length of stays in the intensive care unit and hospital ward were longer compared with patients with no ECMO preoperatively (P < .001). Their creatinine levels were higher preoperatively and on the 1st, 2nd, 3rd, and 4th postoperative days (P < .05), but after that no statistically significant differences could be measured (Table 3). Our study reported a 1-year survival rate of 95%, thus confirming earlier results.1,2 A notable amount of patients (12%) needed preoperative ECMO support. Despite this, 1- and 3-year survival rates were rather high. Fluid balance was well on the positive side on the day of surgery but normalized quickly on the first postoperative day. In Finland, lung transplant procedures are performed under cardiopulmonary bypass, which inevitably leads to fluid overload intraoperatively. Well-planned fluid replacement therapy, especially for this complex procedure, is important to minimize fluid overload. Impaired renal outcome is a common com­plication after lung transplant. Renal function declines progressively in most lung transplant recipients (> 90%).11 Chronic renal failure has been reported to be > 15% at 5 years after lung transplant.11 In our study, mean GFR at 1 year after transplant was more than 50 mL/min, with only 3% of patients having GFR lower than 30 mL/min. Acute kidney injury is associated with increased morbidity and mortality.12 In this study, 8 patients (8%) needed postoperative renal replacement therapy, which is higher than what has been reported earlier.12 This finding might be due to the small number of patients included. Another explanation could be the different triggers to start renal replacement therapy in different centers. Again, in only 3 patients, GFR remained low (under 30 mL/min) for a longer time, and only 1 patient needed a renal transplant. In patients on ECMO, creatinine levels were significantly higher preoperatively compared with those without ECMO. The difference in creatinine levels remained 4 days after transplant; however, after this, it became similar in all patients. This finding reflects rather rapid recovery of renal function in this group of patients. Limitations of our study are its single center retrospective design and the relatively small amount of patients. This could limit the generalizability of our findings to other lung transplant populations. In conclusion, intraoperative use of hydroxyethyl starch and fresh frozen plasma was associated with worse patient outcome. However, postoperative use of blood products or colloids did not affect patient outcomes. Mahida RY, Wiscombe S, Fisher AJ. Current status of lung transplantation. Chron Respir Dis. 2012;9(2):131-145. Tomaszek SC, Fibla JJ, Dierkhising RA, et al. Outcome of lung transplantation in elderly recipients. Eur J Cardiothorac Surg. 2011;39(5):726-731. Hämmäinen P, Halme M. Lung transplantation today--modern treatment with excellent results. Suomen Lääkärilehti. 2011;66(33):2333-2338. Murphy GJ, Reeves BC, Rogers CA, Rizvi SI, Culliford L, Angelini GD. Increased mortality, postoperative morbidity, and cost after red blood cell transfusion in patients having cardiac surgery. Circulation. 2007;116(22):2544-2552. Hartog C, Reinhart K. CONTRA: Hydroxyethyl starch solutions are unsafe in critically ill patients. Intensive Care Med. 2009;35(8):1337-1342. Piazza O, Scarpati G, Tufano R. Update on transfusion solutions during surgery: Review of hydroxyethyl starches 130/0.4. Int J Gen Med. 2010;3:287-295. Bagshaw S, Chawla L. Hydroxyethyl starch for fluid resuscitation in critically ill patients. Can J Anaesth. 2013;60(7):709-713. Myburgh JA, Finfer S, Bellomo R, et al. Hydroxyethyl starch or saline for fluid resuscitation in intensive care. N Engl J Med. 2012;367(20):1901-1911. Serpa Neto A, Veelo DP, Peireira VG, et al. Fluid resuscitation with hydroxyethyl starches in patients with sepsis is associated with an increased incidence of acute kidney injury and use of renal replacement therapy: A systematic review and meta-analysis of the literature. J Crit Care. 2014;29(1):185.e1-185.e7. Mutter TC, Ruth CA, Dart AB. Hydroxyethyl starch (HES) versus other fluid therapies: Effects on kidney function. Cochrane Database Syst Rev. 2013; (7):CD007594. Hellemons ME, Bakker SJ, Postmus D, et al. Incidence of impaired renal function after lung transplantation. J Heart Lung Transplant. 2012;31(3):238-243. George TJ, Arnaoutakis GJ, Beaty CA, et al. Acute kidney injury increases mortality after lung transplantation. Ann Thorac Surg. 2012;94(1):185-192. Toyoda Y, Bhama JK, Shigemura N, et al. Efficacy of extracorporeal membrane oxygenation as a bridge to lung transplantation. J Thorac Cardiovasc Surg. 2013;145(4):1065-1071. Bermudez CA, Norihisa S, Diana Z, et al. Contemporary outcomes of lung transplantation using extracorporeal membrane oxygenation as bridge. J Heart Lung Transplant. 2013;32(4):S266. Acknowledgements: The authors have no sources of funding for this study, and they have no conflicts of interest to declare.